Roger Fry was a senior member of the Bloomsbury Group, a respected art critic who mingled with Leonard and Virginia Woolf, Lytton Strachey, Vanessa Bell, Duncan Grant and the gang. He championed modern artists such as Cezanne and Matisse, and was such a prominent figure in Britain that his son, Julian, saw that he was likely to spend his life in his father’s shadow, as “Roger Fry’s son”. So Julian came to Canada, and became a hard-riding rancher in B.C.’s Cariboo, where art critics were not an important part of life. There he raised his son, Alan Fry. Born in Lac La Hache in 1931, young Alan was a real Cariboo boy, raised around horses and cattle, and skilled with a rope and an axe. In 1962, he revealed an extra dimension when he published his book about growing up, Ranch On the Cariboo. Reviews in Canada were equally admiring, but the harsh portrait of a dysfunctional reserve, written by a civil servant, led to an angry chorus of voices wanting him fired. Alan went to his local band, and left his fate in their hands. After a meeting they reported that they wanted him to stay, and told the rest of the world that Alan was their guy, and everyone else should back off. A respected native leader visited the reserve in question, and wearily reported to Alan that things were, in reality, even worse than in the book. Alan kept on writing, from his base on Quadra Island, near Campbell River, where I visited him twice. In 1971 he brought out Come A Long Journey, about a canoe trip down the Yukon river with the narrator and his Native friend Dave. The Revenge Of Annie Charlie (1973) dealt with Native conflicts with the RCMP in a humorous way. In 1974 he reverted to his old Cariboo ranching background with The Burden of Adrian Knowle . Then he got tired of the bureaucracy in Indian Affairs, and quit. What should he do now? Well, he had loved the time he had spent in the Yukon, and decided to move there. But how? How could he get a grubstake when his only asset was his house on Quadra, surrounded by Douglas Fir trees? His Lac La Hache skills provided the answer. With his axe he felled enough trees to make a two-storey log cabin, built the old way, with interlocking timbers and not a single nail. I visited the house, which was a thing of beauty. And now Alan had two houses to sell, to keep him going in the Yukon. Just north of Whitehorse, beside Lake Laberge, he erected a tepee, and lived in it year-round, even during the months when he was surviving under 40 below ( where Celsius and Fahrenheit meet) temperatures in a tent. I was back in my warm office in Toronto, fascinated by all this, and in due course a book came out of it, a non-fiction guide called Survival In The Wilderness. Read it…..it may save your life one day. Then a woman came on the scene, and the tepee life became less attractive than life in a house in Whitehorse…. 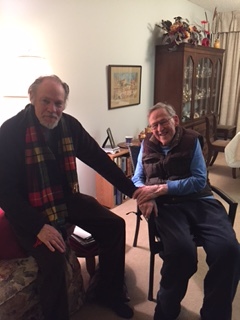 I visited that house in January, to catch up with my old friend Alan. We’ve stayed in touch over the years, always with great pleasure. My pride in working with Alan over all this time was revived a few years ago when my friend Howie White, of Harbour, realising that How A People Die was still – tragically – relevant today, reissued a new edition of the great classic. At 84, Alan is now not as young as he once was, and is fighting a number of health challenges. But as you can see from the attached photo, he and his editor and friend for so many years are damned glad to see one another. And I’m glad to pay tribute to an important Canadian author. This entry was posted in Behind-the-Scenes, Companion Reading, Dispatches from the Road, The Show.